LOWER LEVEL: This level of seating is in front of the stage (which is 3 ft higher than the Lower Level floor). Depending on the show, the Lower Level of seating can be set up with tables or rows of chairs like we currently now do. We can also leave space for dancing at this level or have the entire level standing. Lots of options. 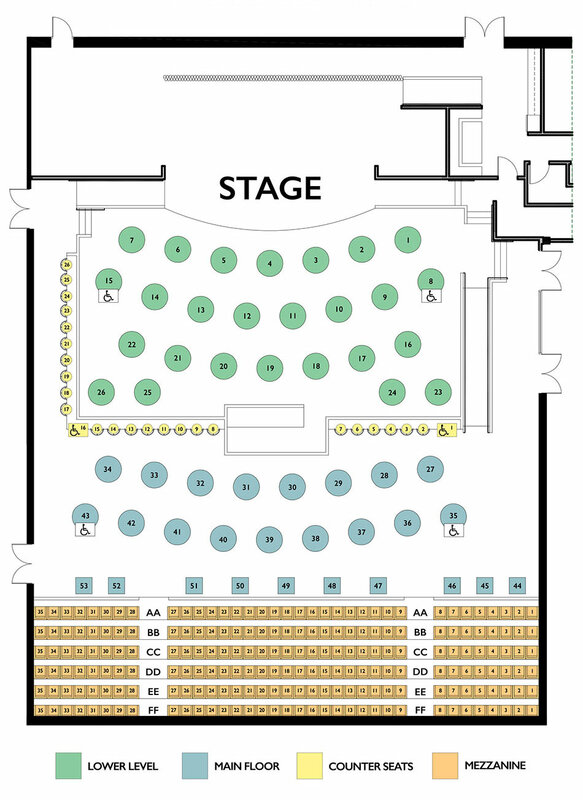 The seating plan for the particular show would identify exactly how this level is seated. The lower level holds 273 with a theatre seated configuration and 156 at tables. The lower Main Floor is roughly 2 feet higher than the lower level and separated from the lower level by a short knee wall. This wall has a granite counter top on it with regular chairs (the ones we use now) in front of the counter. There are 26 seats in this section. MAIN FLOOR: Roughly 2 feet higher than the Lower Level is the Main Floor seating area. 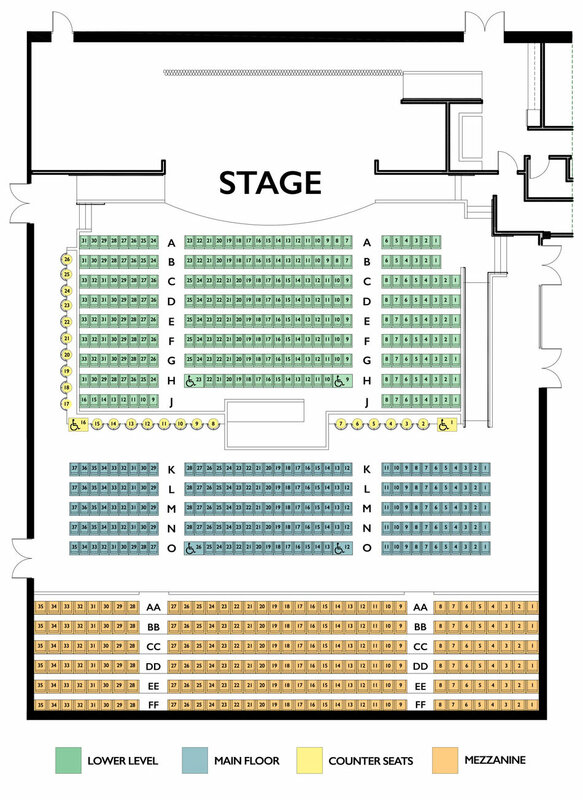 Depending on the show, the Main Floor seating can be set up with tables or rows of chairs like we currently now do. The Main Floor level holds 183 with a theatre seated configuration and 122 at tables. At the back of the venue are 6 tiers of seats that are bolted to the floor. Each tier is 7” higher than the one in front of it. These seats are the wider and more comfortable Theatre-Style seats that you see at performing arts centers. Each seat has a cup holder so you don’t have to hold your drink the whole show. There are 210 seats in this seating section.